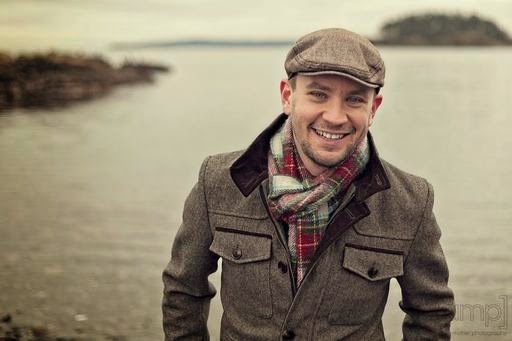 We're excited to have Aidan Moher with us today! Moher is already well-known in the field for his Hugo Award-wining blog, A Dribble of Ink--home to some of the best book reviews you will ever read. But you may not know that Moher is also a writer, and today he is releasing a debut collection of short fiction, Tide of Shadows and Other Stories . He has also recently posted one of the collected stories, the excellent "Tide of Shadows," for free on Medium. NoaF: Tell us a little bit about Tide of Shadows and Other Stories--what kinds of stories does it include? 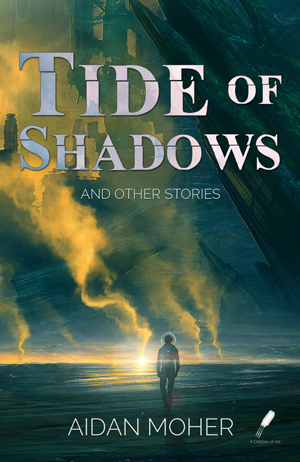 Tide of Shadows and Other Stories is my first short story collection. It contains five science fiction and fantasy stories spanning adventure, comedy and drama—from a star-faring military science fiction tale of love and sacrifice to a romp through the dragon-infested Kingdom of Copperkettle Vale. “A Night for Spirits and Snowflakes” is the story of a young man reliving the last moments of his fellow soldiers’ lives; “The Girl with Wings of Iron and Down” tells the tale of a broken family and a girl with mechanical wings; “Of Parnassus and Princes, Damsels and Dragons” introduces a typical prince, princess, and dragon—and a not-so-typical love triangle; “The Colour of the Sky on the Day the World Ended” follows a girl and her ghost dog as they search for a bright light in the darkness; and “Tide of Shadows” is about a soldier and his lover, a mother, and a planet-wide genocide. I've included notes that explore the origins of each story, reflections on how I've changed as a writer over the years, how the stories might look different if written now, and questions that I hope will make it interesting for readers to revisit them with a new perspective. NoaF: You mention that there are both science fiction and fantasy stories in the collection. Some authors do both, of course, but more seem to specialize in one side or the other. Yet a collection, one presumes, has a thematic core. So I’d like to know--do you approach SF and fantasy differently, or are these just different settings for similar kinds of stories? The latter. I think science fiction and fantasy--at least the kind that I seem to write--is all part of the same canvas. They're built on speculation, on exploring worlds and themes, cultures, and problems that are more easily dissected when we remove the biases that come bundled with narratives set in the 'real world.' All of my stories about about the characters first, and I fit everything else around them. Whether its the rolling hills of Copperkettle Valley ("Of Parnassus and Princes, Damsels and Dragons"), or the cold halls of the Spirit of a Sudden Wind ("Tide of Shadows"), I gravitate to a setting--and a genre/sub-genre--that allows the characters to tell their story. The uncountable number of science fiction and fantasy stories, written by people of all backgrounds, proves that science fiction and fantasy are defined less by their setting than the themes they explore and their ability to view humanity through a speculative lens. Ramez Naam's Nexus could not be more different than Kay Kenyon's The Bright of the Sky, but nobody would argue that they're not both science fiction. The same can be said of Robert Holdstock's Mythago Wood and Melanie Rawn's The Ruins of Ambrai -- both fantasy, both very different in execution, setting, and theme. Science fiction and fantasy writers are the luckiest writers in the world because our canvas is unlimited and begs us to use all colours of paint at our disposal. Hell, it asks us to throw out the paint and use whatever medium suits us best. NoaF: As a follow-up, what if any are the overarching themes you explore in this collection? If you'd asked me this before I compiled the collection, I would have told you there were no overarching themes running through the various stories. Each tale was so individually defined in my head that crossover wasn't something I'd considered. However, reading through the collection as a whole, I noticed several strong themes and explorations that kept rearing their heads throughout. Belonging--almost all of the stories in the collection deal with belonging and community in some way -- whether its a character's struggle to mould themselves to the expectations of others, or the drive within someone to demand of the world that it accept them as they are. Light from darkness--As I mention later in this interview, I'm a big fan of post-Tolkien '80s fantasy, which often puts its protagonist into seemingly insurmountable situations and turns out the lights, only to have them persevere through the challenge by finding their own inner power. It's a classic theme and something I naturally think about a lot while writing. When I was selecting stories for Tide of Shadows, I specifically wanted to include a broad spectrum of fantasy and science fiction narratives -- from the gritty and violent "A Night for Spirits and Snowflakes", to the sugary and pun-filled "Of Parnassus and Princes, Dragons and Damsels". As you say, I believe that fantasy is an infinitely wide spectrum, and different sub-genres are better viewed as tools, rather than labels. I think the best gritty fantasy can steal moments of levity from satirical fantasy. And, on the flip side, lighter, adventurous fantasy can steal the dark parts from gritty fantasy to put an exclamation point on the parts that are really supposed to take a hold of a reader. I wrote about this fairly extensively a few weeks ago when I dissected my relationship with 'grimdark' fantasy fiction. I'll admit that my heart--as both a reader and a writer -- lies with the epic fantasies of the '80s and early '90s. Terry Brooks. Tad Williams. Barbara Hambly. Raymond E. Feist. They're all important to me, and, somewhat surprisingly, as I grow older, now a father, I find myself coming back to that style of storytelling more and more. Sometimes I just want to read a travelogue adventure story about a band of humans, elves, and dwarves fighting against a bad dude. However, in recent years I believe that this style of fantasy has been given the short shrift. Barbara Hambly's Dragonsbane is a straightforward fantasy adventure about an aging hero's quest to slay a dragon -- but, it's also an incredibly sharp narrative about power and women in patriarchal societies. The writers of the '80s often used simple narratives to frame complex thematic explorations, further blurring the line between the perception of fluffy epic fantasy and its "more mature" older brother that the market is currently obsessed with. "A Night for Spirits and Snowflakes" was directly influenced by Joe Abercrombie's work, and I hope, like his work, there's enough nuance in the story to please readers on both a thematic and more visceral level. NoaF: How do you see original short story collections fitting into the broader ecosystem of SF/F? I think there are two factors at work here, one that's been established for decades, and another that's unique to the modern SF/F ecosystem. First, I see short stories as a peculiarly good medium for taking risks; by its nature, short fiction has an agility that long-form fiction simply doesn't. It's the perfect environment for writers to try new techniques, lay the ground work for larger works, breathe if they're stuck under another larger project, or take risks that might be too big in the higher stakes novel game. Because of this, short fiction is where a lot of SF/F's most exciting, progressive and interesting writing happens. Second, you have the emergence of the Internet as a publishing tool--it's never been easier for a story to find readers. Whether its through traditional publishing channel--such as anthologies or pro-paying short fiction magazines--or the bleeding edge of digital- and self-publishing, the megaphone for writers is broadening from a realm ruled by long-tenured gatekeepers, to a wild west full of new anthologists, new writers and new publishers. Authors that might previously have been shut out--told their work wasn't commercial enough, wouldn't find an audience--now have the authority and courage to make that decision themselves. Combined, these two factors are creating a short fiction environment that embraces authors from every walk of life. I'm thinking about writers like John Chu and Octavia Cade, Rochita Loenen-Ruiz and Sunil Patel--new and exciting voices that we may not have heard from a decade ago. It's a terrifically exciting time to be involved in the field, I think. As for original collections themselves, they're an opportunity for readers to discover not just a new voice, but different variations on that voice. A single short story is a focused introduction to the author's voice--a single note ringing out clearly through a concert hall--but a collection allows that authors voice to become a complete symphony. Is there a risk involved in buying a full collection of short stories without having access to them individually online? Sure. But no more than buying a book from a novelist you're unfamiliar with or an anthology compiled by a new editor. This can also be mitigated by the author through careful promotion and publishing one or two stories ahead of time -- just enough to give readers a taste of what they'll find in the collection, but not so much that they feel like they have experienced everything the author has to offer. Is there a market for original short fiction collections? I don't know. I expect I'm about to find out over the next several weeks, however. Early pre-order numbers have been favourable, though. NoaF: Tell us a little about your decision to self-publish. What informed that decision? What makes self-publishing exciting? The decision to self-publish Tide of Shadows was reached after a long-winding path after several years of consideration. The oldest story in the collection was written in 2010, and the youngest in 2014. There's a big gap in time between those dates where I was writing a lot of short fiction and submitting it to short fiction markets. Like a lot of aspiring writers, I was flooded with rejections--some polite personalized rejections from high level editors, some form rejections from early slush readers. Each letter drove me to write more, to submit again. It's a game, and I wanted to win. However, over those years, my definition of "winning" changed. At first, I believed that to win the game I needed to be validated by editors of pro-paying fiction markets. I wanted to see my name on the marquee beside Rachel Swirsky and Ken Liu, lights shining bright. I thought I could skip community theater and head straight to Broadway. Confidence is essential in the publishing world, but it's also a double-edged sword. See, the pro-paying markets are difficult to break into -- and for good reason: they're the best of the best. So, my definition of winning the game changed. I started to think about why I wrote, what my goals were for each story I produced. Aside from the worst of them, I wanted readers for my stories -- I wanted to set them free. My desire to publish my own fiction went as my opinion of the self-publishing industry went. During the early days, I thought it was a lawless wild west full of writers who's work was little more than vanity projects -- surely all the good stuff was getting snapped up by legitimate publishers? We know now that that's far from the truth. There's too much good stuff out there for publishers to find it all. We've seen so many success stories in the self-publishing world that you can no longer say with a straight face that it's for writers who aren't good enough to make it in traditional publishing. At about the same time I started reconsidering my opinion of self-publishing, I also began to realize that I was feeling weighed down by the stories, the the initial feeling of inspiration from those rejection letters was becoming a pair of cement boots. I wanted to be excited about these stories -- I knew they were good enough to find readers, despite limited success with pro-paying markets -- and then I realized that self-publishing was the solution. It would give these stories life, and allow me to let them go. Their voices could natter along in readers' heads, not mine. So, Tide of Shadows and Other Stories was born. I also saw self-publishing the collection as a learning experience, and opportunity to see the industry from the other side of the table. I've worked with a lot of writers, editors, and publishers, but I'd never really been immersed in the process of creating a book. It was terribly fun experience, and I already have some ideas of how to make my next book even better. NoaF: What, in your opinion, should readers who are considering self-publishing know about the process? What information have you learned that you’d want to impart to others? One, hire a copyeditor! Seriously. This is the best money you can spend. It ensures that your manuscript is as clean and professional as possible, which allows your readers to focus on all the good bits of reading a book -- plot, character, themes, etc. -- without becoming distracted by typos, poor grammar, and improper punctuation. I highly recommend Richard Shealy's SF/F Copyediting. Fair rates, fast, and he has a history of working with some of the best SF/F writers and publishers in the industry. Two, have good cover art: This can get pricey, but the payoff is undeniable. Along with poor copyediting, self-published books often have terrible cover art. Sometimes this is because the author made the cover themselves, or they hired a bad or inexperienced designer to make it for them. Some even use cover generators. None of these options are suitable, frankly. A lot of self-published authors begin their project with a limited budget. So did I. Working within my budget, I licensed a piece of art and did the typography/design myself. I have professional design experience from my day job, so I was able to get away with doing the work myself. But wherever possible, have a professional do the heavy lifting. There are a ton of talented illustrators and designers on DeviantArt, and their rates are often surprisingly affordable. Work within your budget, but don't skimp. My entire budget for Tide of Shadows was $300. Also, I wrote about why (and how) I self-published my short story collection at some length a couple of weeks ago--I tried to make it a useful resource, so anyone who wants to learn from my experience can do so, and I've been told by a few writers--published and aspiring--that it is. So, if any readers are interested in self-publishing, or just want a deeper understanding of my process, please check it out. NoaF: Okay, I want to switch gears for our last question. The cover art for the collection is stunning. Who can we credit for that, and could you walk us through the design process? Thanks, G. Despite the old adage, we do judge books by their covers, especially in this Internet age that exposes us to thousands of new books each year. A good cover--especially for a self-published book--is an essential tool for capturing the eyes of new readers. Since debuting the cover a few weeks ago, I've had dozens of comments from readers--some I've known a long time, others I've only just met--complimenting the cover. That's a huge win, and I'm very proud of it. The illustration for the cover is by Kuldar Leement, a wonderful digital illustrator and graphic designer from Estonia. I initially fell in love with Leement's artwork for its ethereal ability to transport me to the strange corners of the universe--in a lot of ways its pure, classic SF, full of wonder, and recognizable tropes, but it also manages to be unique, intensely personal, and unpredictable at the same time. I hope to see his art on the cover of more science fiction novels in the future. Within the small budget I had for the book, earmarked some of it for cover art. I knew I wanted to have a piece of art that really caught the attention of readers, but I quickly found out that my budget didn't allow for commissioned artwork from the artists I liked. So, I decided to follow the SF/F Magazines--Clarkesworld, Uncanny or Apex--and decided to license a piece of existing artwork. Leement was at the top of my list of artists, so I found a few pieces from his portfolio that I felt would work well and mocked-up some covers to get a sense of which piece was right. Once I settled on "Resistance", I reached out to Leement and we negotiated a price and terms that fit within my budget. As I mentioned, I have a bit of an advantage over most other self-published authors in that I have a day job as a designer. So, I was able to handle the layout, design and typography myself. 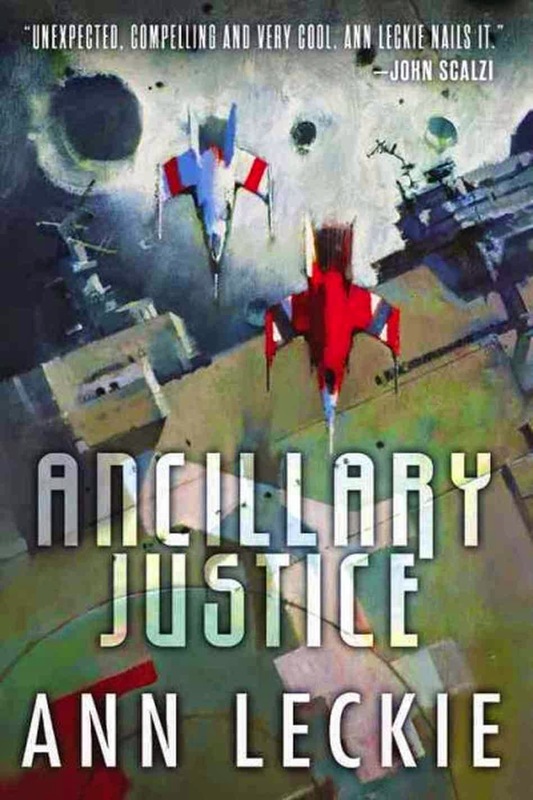 I wanted to capture the feel of Kirk Bischoff's work on Ancillary Justice by Ann Leckie, but the cover went through several revisions before I landed on the final variation. Outside of a copyeditor, I think hiring a good cover artist/designer is about the best thing a self-published author can spend their money on. It's going to make the difference between your book looking like a pet project and a professional product. NoaF: Well, that just about wraps things up. Thanks for "sitting down" with us, Aidan!